Driving tests can take weeks, sometimes months of waiting. They’re not cheap either, so it’s essential that the correct items are taken with you else the examiner may cancel your test and you’ll also lose the test fee. Your valid, signed photocard driving licence is the most important document to take to your driving test appointment. If you have lost your licence, you must order a replacement before your test date and this may take up to 15 days to arrive. You can order a replacement licence here. If you do not believe you’ll receive your licence in time, it may prove beneficial to reschedule your test to a later date. If you have a photocard licence that originally came with a paper counterpart, the paper counterpart is no longer valid and holds no legal status, therefore it is no longer required to be taken to a driving test. 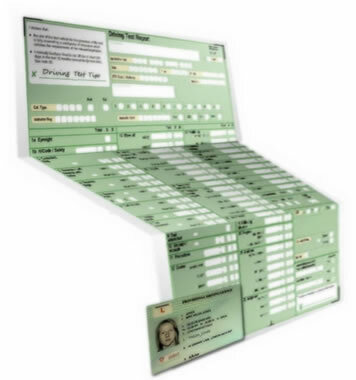 If you still retain the old-style paper driving licence ( no photocard and issued before 1998), take this along with a valid passport to your appointment. If you have lost your theory test certificate and are wondering if you need to take it to your driving test, in our experience, most examiners will conduct your driving test after validating your driving licence. If you have lost your theory test certificate and don’t want to risk taking your test without it, contact the DVLA who will send you a letter confirming that you have passed the theory test. You can take this letter to your driving test appointment. The lost theory test certificate page provides further information on obtaining these. Driving instructor car – Most driving tests are conducted using a driving instructors car. Your instructor will take care to ensure it meets the requirements. Own car – You can take your own car to take your driving test in but it must meet legal requirements for use on public roads and specific requirements set out by the DVSA. It must also have L plates visible and securely attached and take along and extra internal driving test mirror for the examiner to use. See car for driving test for further information. Hire car – You can hire a car specifically for the driving test, but it must meet the same legal and DVSA requirements of those that are of your own car and it must have dual controls.